Located at 28 kilometers from Batumi center, the Bridge Makhuntseti lies in the village of Makhuntseti off the Batumi–Khulo central motorway. A formation of spectacular volcanic rocks and lime, this bridge adjoins the two sides of the the River Makhostskali. The Makhuntseti waterfall too is a popular attraction here. Buarufully arched, this bridge is a delightful experience as you walk its pastoral path, with wind whisking you a breath of fresh, fresh air! If you feel a little adventurous, go ahead and take a cold, mighty rejuvenating dip in the waters of the river or better yet, stand under the falls! And if you don’t feel that adventurous you can still enjoy bath in the stone bowl under the falls. Some legends go that the bridge was built by Venetian and Genoa builders, while some believe that it was built much before the reign of queen Tamara in the 12th century. The bridge spans a length of about 20 meters and a height of 6 meters. There are a few restaurants around, in case you get hungry. Recommended time to visit between: 07:00 am to 08:00 am. Bridge Makhuntseti Address: Makhunsteti village, batumi, Georgia. How popular is Bridge Makhuntseti? People normally club together Botanical Garden and Nobel Brothers Batumi Technological Museum while planning their visit to Bridge Makhuntseti. People also prefer to start their day with Bridge Makhuntseti. Very cool. 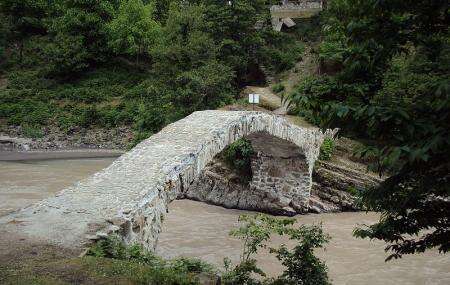 The bridge is built in 12th century when the King Tamari rained, that’s why Georgians call it Tamari’s Bridge. Hello readers and travellers, makhuntseti is the suburbs of batumi, from the city center it will take 45 min, most popular adventure is rafting around 4 km track. Second place is a long waterfall, so its nice for spending half day, must see attraction.